Buckle up for the 2018 Texas Auto Show! Media Day included big announcements from a long list of top manufacturers, ranging from unveilings of all-new models to upgrades and new features being added to the current lineup. Since 1913, the auto show has been an important part of the Fair, and the Fair is proud to continually provide an engaging environment where automobile manufacturers can interact with consumers through automotive displays and experiences. Each year, the State Fair of Texas plays host to some of the latest and greatest in the auto world. Whether you’re a diehard car fanatic or you just like to look around at the newest models, this event is the ultimate destination for all things auto. Highlights from each manufacturer featured at today’s press conference can be found below. Chevrolet introduced a stylized 2019 Silverado High Country at Texas Auto Show Media Day, highlighting Chevrolet’s collection of truck accessories and performance parts for the all-new Silverado. The catalog of genuine performance parts and accessories were designed and developed along with the new truck for seamless design and performance integration. Envisioned as a premium outdoor truck, the accessorized High Country model blends high style, functionality and enhanced performance, including the all-new segment-exclusive Power Up-Down tailgate. Chevrolet’s concept vision starts with a two-inch suspension lift and concept bronze exterior accents, including the grille and 22-inch wheels. The High Country is one of four concepts Chevrolet will introduce this fall, each designed to showcase how customers can accessorize the new Silverado to suit their personalities. The Chrysler brand featured the consecutive award-winning family vehicle, the Chrysler Pacifica and the Pacifica Hybrid. The Pacifica reinvents the minivan segment with an unprecedented level of functionality, versatility, technology and bold styling. Re-engineered from the ground up on an all-new platform, it delivers class-leading gasoline and hybrid powertrains to the minivan segment. With more than 100 available safety and security features, the all-new Uconnect Theater rear seat entertainment system, tri-pane panoramic sunroof, and a full array of comfort, convenience and driver assistance technologies, the Chrysler Pacifica is a no-compromises minivan ideally suited for today’s families. Ford Motor Company unveiled four luxury SUVs including the all-new Expedition Texas Edition, Explorer Limited Luxury Edition, and Explorer Desert Copper Edition. The Expedition Texas Edition builds upon the existing Special Edition Package, featuring wheels from the Stealth Edition and Texas Edition badging. Based on a Limited trim model, the Expedition Stealth Edition wears gloss-black accessories for a cool yet upscale appearance and rolls on 22-inch premium black-painted aluminum wheels with continuous controlled damping. The Explorer Limited Luxury Edition is available in two variations. Explorer owners can upgrade to get 20-inch premium painted machined aluminum wheels, multi-contour seats with Active Motion®, Nirvana leather seats with micro-perforation, an upgraded leather steering wheel, door trim with leather inserts, and chrome mirror caps. The Explorer Desert Copper Edition upgrades an XLT model to include 20-inch polished aluminum wheels and Ebony Black interior features. Kia Motors America’s largest and most refined SUV – the all-new 2020 Telluride – made its appearance at Media Day. The vehicle features several nods to his Texas roots, including natural wood interior trim and saddle-inspired double-stitched leather adornments on the dash, door panels, and grab handles. Similar leather details cover the outside rearview mirrors and door handles to compliment the vehicle’s deep green paint color. Custom front and rear bumpers, skid plates and sidestep sills exude a ranch-ready look, complete with off-road tires that wrap around flat-black alloy wheels and an aluminum roof rack with a leather tow strap tongue. The eight passenger Telluride production model will provide a new, V6-powered option that is several inches longer and wider than Kia’s award-winning, seven passenger Sorento midsize SUV and is scheduled to arrive in showrooms in early 2019. Fred DePerez, vice president, Nissan North America LCV Business Unit, unveiled the 2019 Nissan TITAN to a large group of media on Thursday. The 2019 TITAN is the first in its class to offer the new Fender® Premium Audio System, featuring 12 speakers and amplifier power of 485 watts through nine channels. Other 2019 model year enhancements include standard 7.0-inch touchscreen audio/IT display with Apple CarPlay™ and Android Auto™ on all models, and a new Rear Door Alert system. The TITAN and TITAN XD once again will feature “America’s Best Truck Warranty” 1 – featuring bumper-to-bumper coverage of 5-years/100,000-miles, whichever comes first. Ram revealed the new 2018 2500/3500 Heavy Duty Longhorn “Ram Rodeo” Edition. Based on the Longhorn trim, the Longhorn Ram Rodeo adds content to this luxury pickup leading in style, durability and capability. Loaded with premium materials, the Longhorn interior presents unique features and design cues. The Longhorn Ram Rodeo Edition builds on that theme by adding a suede headliner against beautifully contrasted interior colors such as Black and Cattle Tan. The truck includes a 5th wheel/gooseneck trailer prep package and bed-view camera to provide owners with a factory solution for heavy trailers and deliver a clear view to align with the hitch point. The Longhorn Ram Rodeo also features Ram’s exclusive rear air suspension for comfort and expert load-leveling when hauling payload or trailer. Making its presence felt in its new home state, Toyota announced exciting news at the State Fair of Texas media day with the addition of three new options for 2019: 4Runner Nightshade Special Edition, Tacoma SX Package, and Tundra SX Package. Each new offering provides a heavy dose of style that aims to be light on the wallet. The 4Runner Nightshade Special Edition adds mystique to the Limited grade on which it’s based with stylish upgrades and Black exterior and interior accents. The Tundra SX Package is available on the SR5 grade Double Cab in 4×2 or 4×4 and powered by the 5.7-liter i-FORCE V8 engine. Relying on a selection of color-keyed accents and blacked-out wheels, it combines thoughtful upgrades to create what may be the cleanest Tundra to date. The Tacoma SX Package is based on the Tacoma SR grade and is available on 4x2s and 4x4s. Receiving a black-out treatment on high-visibility parts, it also gets the addition of 16-inch matte black alloy wheels. 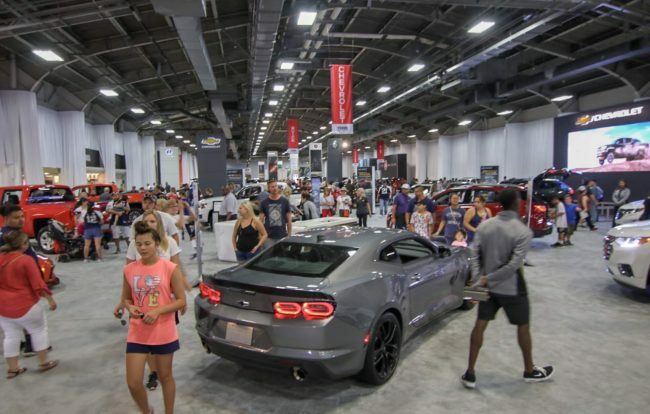 Ideal for fairgoers looking to purchase a new car, or simply learn more about today’s available options, the Texas Auto Show is full of experts from each of the manufacturing companies, ready to help you with any questions you may have. In addition to checking out the hottest new rides, visitors can enjoy fun interactives and live entertainment throughout the various auto displays at the Fair.